Omar does an exceptional job working for our Marketing Department. He has truly become an integral member of our Brownstein family. He embraces our cultural values of All In, Excellence, Respect and Giving Back. 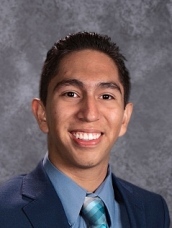 A great example of Omar's dedication and commitment to excellence is how Oma took on mentoring our freshman intern without ever being asked to do so. He has reassured her and eased her entry into the work world more than I ever could. This mentorship goes beyond the work environment. He watches out for her at school, on the cross country team and on the mock trial team.